Although yesterday when I woke up, it sure didn’t feel that way. I was alone in a hotel room in Houston, exhausted, with a headache brought about most likely by lack of sleep combined with relentless mental list-making. The last two weeks had been excessively full. Somehow I had responded with an enthusiastic “Yes!” to layers of opportunities and commitments, without realizing that they all fell during the same time frame. Each of the opportunities felt valuable, and I was being deliberate and selective as I accepted each. I just didn’t calendar appropriately, so they all converged. Along with adding my regular weekly blog posts to my to-do list, I added preparations for an upcoming local makers pop-up shop with my newly launched handmade business, Live Free Creative Company. It seemed simple enough to buy materials, hand-dye fabric, sew products, design and order tags, labels, and packaging; design and set up the display; shoot product images; add inventory to the online shop; as well as advertise and set-up for the month-long event. Right? The process would not really simple at all, actually, I just didn’t take into account the many arrangements the event would require from my embryonic business. Instead of blocking out necessary weeks for dedicated preparation, I had been fitting it in around everything else. I hosted an indigo dyeing workshop, participated in a blogger mastermind group meeting, hosted a community book club, and emceed Thrive Creative Conference, all last week. Meanwhile, also completing 20 hours of CEU credits on the computer late at night to qualify to renew my RN license, that would otherwise expire tomorrow. All things considered, I felt I was holding it together pretty well, until yesterday. I had made a great master to-do list; divided by project with dates and deadlines. I was focusing on one task for one project at a time, taking small bites of of each per day. In addition to work projects, I made sure I had time to go to the gym, take Plum to the park and playgroup, deliver lunch to the boys at school when they requested it, and go on my regular date-night with Dave. I was getting things done. Checking the boxes. Having fun. Feeling grateful. And then, I woke up totally spent after a full day of introducing speakers, and learning from industry leaders. I was out of energy, and out of enthusiasm. No longer able to keep my head above water, I had begun to drown. Tears came as I realized slowly that I likely would not be able to accomplish all of what I had planned. I was so tired; tired of working, tired of trying, tired of feeling like I was failing. Sometimes when I can’t keep up with the pace of my own life, I experience a minor existential crisis. The feelings of inadequecy extend to beyond the specific situation at hand and make me question my purpose and passions. I begin to compare myself, my accomplishments, my talents, perceived success, and even factors as trivial as social followers, to others. I wonder why I try to keep up with those growing faster, selling more, or doing better; whatever that means. The major problem with comparison is that it is arbitrary. Ideas such as talent and success are perceived differently by everyone. We will always lose when we compare our weakness with other’s strengths. We will always come up short. I know this. I know this. It is still hard to remember it sometimes, and so I cried. My heart ached to hug my kids, take a nap, and feel some peace. I needed a break, and I also needed to get on the road and drive the three-plus hour trip home from Houston to Austin so I could get back in time to teach my Sunday School class. Hours on the road turned out to be a blessing, rather than a burden. As I rolled along down the highway, tears still streaming down my face, I pushed aside my sadness and pieced together a truth that I have learned from, leaned on, and preached, even; the idea of being enough. What if we all took a breath and felt that our worth is intrinsic and not made more or less by our works? What if the value of a woman is determined simply by her being, by the act of her very creation? What if everything else is important, but not fundamental? What if we finally, eagerly, happily decided that we are essential? What if once we acknowledged this in ourselves, we acknowledged it in everyone else? Sisters, you are essential, your birthright is set, your value was sewn about your insides while your heart grew within you. The drudgery of your days, the grand scope of your career, the words you carve into stone while in mortality cannot diminish or make brighter what cannot change. You are already gold and silver and the shine of the stars. If I believe that my worth “…is not made more or less by [my] works, ” then my accomplishments or failures are no longer a measuring stick by which I can compare myself to others, or even to my own goals or ideas of success. If I can not be more or less by what I do; if I can not be more or less by my followers or friends, projects or profits, then I must already be enough. I remember a couple years ago, my sister was reading a new book. It was a collections of memoirs of moms talking about how being a mom was enough. The catch, she told me, was that all of the contributors to the book were mom-bloggers, mom-entrepenuers, and mom-bosses. She complained that it wasn’t entirely believable to accept the idea of motherhood being enough from a whole group who had obviously chosen to do more than stay home with their kids. Where was the book about moms who thought motherhood was enough from moms who lived motherhood being enough? The idea of “enough” is one we have zoned in on this year. We recognized that in our home and in our lives, we had more than enough stuff. We decided to not buy any more stuff, cultivating gratitude for what we already had and patience for what we might want. So far, we are loving the journey of not acquiring more stuff, instead having more time, money, and space for experiences. We have generally been feeling more gratitude and less discontent as we accept and enjoy what we already have inside our home. But what about inside myself? As I drove home yesterday, along with recognizing I have more than enough, I recognized that I am more than enough. None of projects I choose, passions I pursue, goals I set and either accomplish or fail can add or take away from my worth. Just as I don’t need more stuff to make me happy, I don’t need more stuff to make me whole. 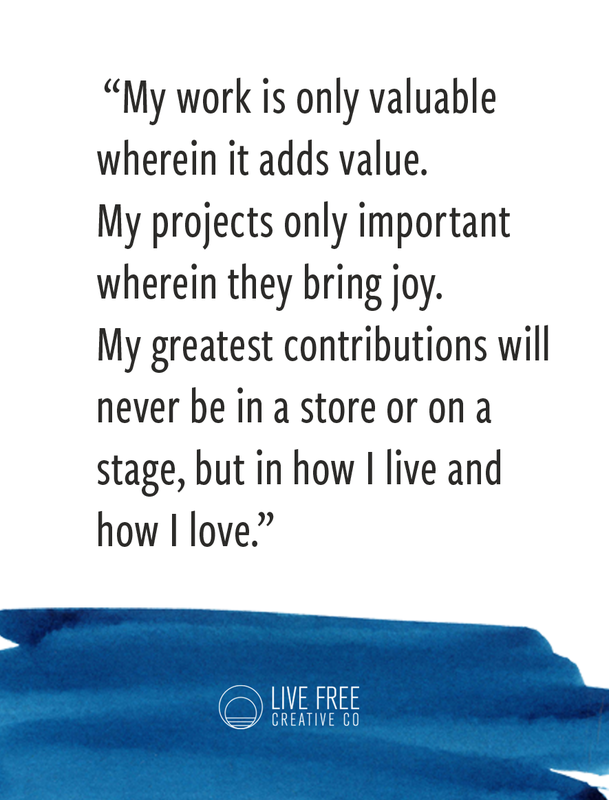 My work is only valuable wherein it adds value. My projects only important wherein they bring joy. 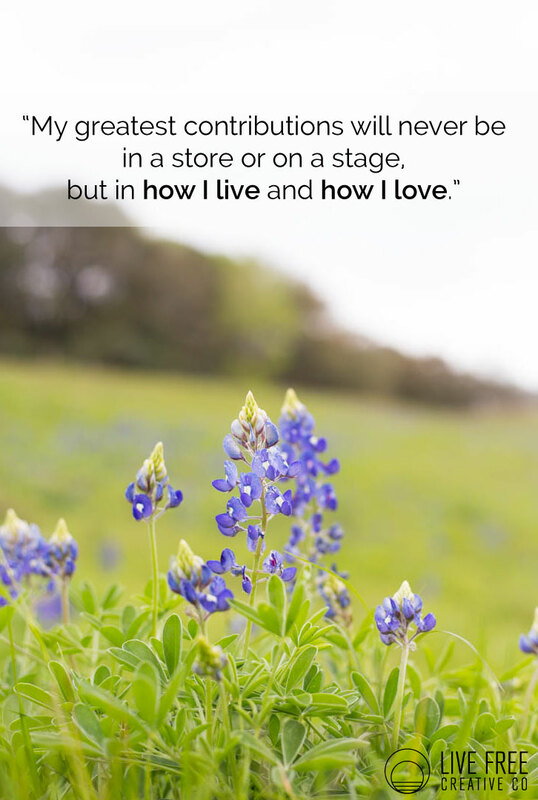 My greatest contributions will never be in a store or on a stage, but in how I live and how I love. Part-way home, I started to notice flashes of purple along the highway. Bluebonnets? In February? 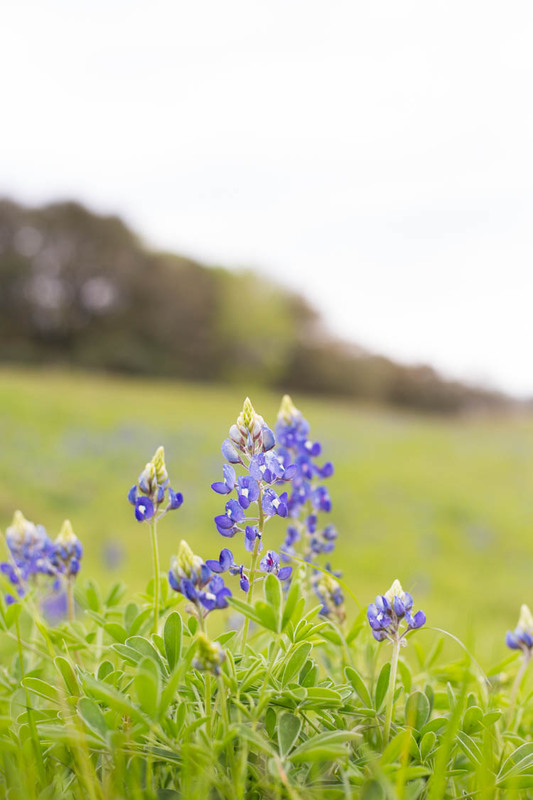 Indeed, the Texas wildflowers had already begun to adorn the fields, a sure sign of spring. Somehow, they felt like a sign for me, too. My tears dried and my heart filled with hope, peace, and truth. Once home, wrapped up in my children’s arms I no longer felt discouraged. I wasn’t only treading water with my head above the surface, rather I was buoyed up by the simple truth that I am more than enough. Nothing has changed about my commitments or the length of my current to-do list. I will put my shoulder to the wheel and continue working hard with a renewed excitement to create, share, and inspire; knowing that nothing I do will add to or take away from the value of who I am. Through the weeks and months ahead, as I am intentional about living in gratitude because we have more than enough stuff, I am also going to work living in the truth that I, myself, am more than enough.